Written and directed by Werner Herzog, Stroszek is the story of a German street performer who is released from prison as he dreams of going to America in the hopes he can find great promise there as he is joined by a prostitute and an old man in his journey. The film is an unusual road film in which a man tries to go to America to see if there is such a thing as the American Dream only to face the realities of his new surroundings. Starring Bruno S., Eva Mattes, and Clemens Scheitz. Stroszek is a mesmerizing yet harrowing film from Werner Herzog. The film follows a man named Bruno Stroszek (Bruno S.) who is released from prison as he has trouble trying to find his role in the world as he joins a down-on-her-luck prostitute and an old man to travel to America where the old man’s nephew lives and work at Wisconsin. It’s a film that is about a trio of misfits who don’t really fit in with the many ideas of modern-day West German society as they hope to go to America to find a new life and something good. Werner Herzog’s screenplay doesn’t just follow the struggle that Bruno, the prostitute Eva (Eva Mattes), and the old man in Scheitz (Clemens Scheitz) as they deal with their dreary surrounding in West Berlin. It’s also for the fact that there isn’t really anything for them as they hope going to America would change things. The first act is set in West Berlin while the second act begins in New York City as they would go to the small town of Railroad Flats, Wisconsin to meet Scheitz’s nephew Clayton (Clayton Szalpinski). With Bruno getting a job working for Clayton in his garage and Eva working as a waitress at a diner, it seems like the idea of the American Dream would come true but it would turn out to be just a myth. Especially in what they had to do to get things they want as it causes all sorts of problems for Bruno, Eva, and Scheitz with Scheitz succumbing to paranoia. Adding to this problem is the language barrier and cultural differences as Bruno and Scheitz don’t speak nor understand a word of English with Eva being the only person who can as she becomes indifferent to her surroundings as well as towards Bruno. Herzog’s direction is definitely straightforward for much of the film while it is also very offbeat in terms of how he showcases America from a foreigner’s point of view. Shot on location in West Berlin, New York City, parts of North Carolina, and various small towns in Wisconsin such as Madison, Nekoosa, and Plainfield. Herzog would create something where it play into individuals who have no place in the world as Bruno’s release from prison has him forcing to not do certain things like drink alcohol or get into trouble as the first place he goes to following his prison release is a bar and have a drink of beer. Yet, life in Berlin is quite troubling as he’s constantly bullied by a couple of pimps who often abuse Eva while finding places to play his accordion and glockenspiel become harder forcing him to believe that America might be the place to go. Much of Herzog’s approach to compositions has him using close-ups and medium shots to play into the way the characters deal with each other and their situations as there are a few wide shots for the scenes in Berlin. Once they arrive to America, the wide shots are more prominent as it displays this sense of culture shock and bedazzlement for the scenes in New York including a shot at the observatory floor at the Empire State Building. The scenes in Wisconsin are also straightforward as Herzog would use non-actors to be in the film to give it a sense of authenticity as well as that sense of confusion the Germans would deal with upon their arrival. Much of the approach to compositions remain the same but the tone is different as it has bits of humor but also some low-key drama as it play into not just this sense of alienation for these characters but also the growing dissolution among the three as Scheitz’s interest in animal magnetism and Eva’s own interest toward truckers add to Bruno’s own sense of loneliness. The film’s climax which is set in another small town somewhere in America doesn’t just play into Bruno’s own realization of the myth of the American Dream but also wonder if there is a place for him in the world. The film’s ending is definitely brutal mainly for its imagery as it has something that is very dark in its humor but also says a lot about humanity trapped into the expectations of their role in society. Overall, Herzog crafts a haunting yet intoxicating film about three Germans traveling to America to find a new life only to face the realities of the world. Cinematographer Thomas Mauch does excellent work with the film’s cinematography with the look of the low-key yet naturalistic lighting for the scenes set in Germany to the more colorful look of the scenes in America including some of the dreary scenes in Wisconsin. Editor Beate Mainka-Jellinghaus does brilliant work with the editing as its usage of jump-cuts play into some of the drama and humor as it is a highlight of the film. The sound work of Haymo Heyder and Peter van Anft is superb for the way it captures all of the natural elements of the location without the need to heighten the sounds. 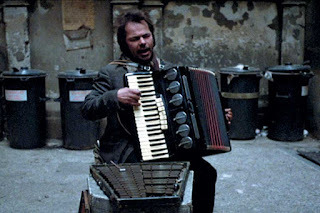 The film’s music consists of an array of musical pieces such as the stuff Bruno performs with his accordion as well as some country music from Chet Atkins and Sonny Terry. The film’s incredible cast mainly consists of non-actors such as Clayton Szalpinski as Scheitz’s nephew Clayton, Scott McKain as a banker, Ely Rodriguez as Clayton’s assistant, Ralph Wade as an auctioneer, and the duo of Wilhelm von Homburg and Burkhard Driest as a couple of brutal pimps who bully Bruno and often abuse Eva. Clemens Scheitz is amazing as Scheitz as Bruno’s elderly neighbor who is given a chance to go to America as he becomes interested in animal magnetism while dealing with the downside of American society. Eva Mattes is great as Eva as a young prostitute who has endured a lot of abuse in Berlin as she is eager to go to America where she is able to find her role but becomes indifferent once she is unable to get what she wants forcing herself to take her own direction that wouldn’t involve Bruno. Finally, there’s Bruno S. in a phenomenal performance as the titular character who is this unemployed street performer who just got released from prison as he deals with his role in the world as well as the growing sense of alienation in America that forces him to question the decisions he’s made in his life and if there is a role for him in the world overall as it’s just an engaging and eerie performance from Bruno S.
Stroszek is a tremendous film from Werner Herzog that features sensational performances from Bruno S., Eva Mattes, and Clemens Scheitz. Along with its gorgeous visuals and compelling story on alienation and demystifying the myth of the American Dream. It’s a film that explores America from the point of view of those who had never been to the country and deal with the realities to fit in with society. In the end, Stroszek is a spectacular film from Werner Herzog.